The forty to fifty million dollar purchase of TweetDeck by Twitter, covered by TechCrunch this week states that service is safeguarding the brand, revenue stream and platform of Twitter aggressively. Now the question remains about further steps and the impacts of such developments to Twitter community. While everyone is aware of the business purposes of acquiring TweetDeck, nobody is clear about the significances of combining the famous 3rd party app with Twitter. But when you look forward, if Twitter continues to acquire tools, ideas and developers, which of these features will add to its growth as popular social networking and marketing website? Below are important points which Twitter should have in mind if it likes to become as omnipresent as MS Office and not as Internet Explorer. The demands of juggling different social media are beyond control and situation has got much worse. Luckily TweetDeck is handling cross-client management over various social networking websites like MySpace, FaceBook, LinkedIn, FourSquare and other services. Twitter will get them and they are competing services, and possibilities remain that the functionality with such sites will be removed. But cross-platform management of social media will make it more popular. For various social media power users, TweetDeck was an important application that acted as one-stop shop for different kinds of social media management. Hence you and other users must do a favor and retain these functions. The core application of Twitter is very good and helps you known the trending topics online and also to follow your friends. But it is not efficient in organizing huge amounts of RSS feeds. Also it does not give a clear and precise time-based summary of the people who have sent them. It is also not possible to pursue a chat thread over several re-tweets and tweeters. TweetDeck is a very good in power organization already and hence it will add more value to Tweeter. 3. Different Options and Cool Features. The most essential for any professional or power user of any service is the various options available. Every user will have his/her own preferences for design, layout, format of sending messages and to organize social media. The 3rd party app wars are all about searching the application which aligns very close with options that are appealing to user. But the ideal solution is combining those options and allowing the user to decide the applications. So it does not mean that Twitter should repackage itself and convert its interface to TweetDeck but to combine to attractive features of both applications and add it to main Twitter application. There are various developers and tools onboard that will add more functionality and features to Twitter. HootSuite: This deals with cross-platform social media integration. 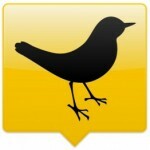 There are many tracking tools available here and new addition in Twitter application community. Klout: This application has features for tracking social media statistics with unique metrics like Network Score, True Reach etc. It is a very priceless tool for getting solid, usable data from Facebook and Twitter.